This is the area for Sequip video probe products. Below you find an overview of our products. Please move forward to get all information about performance, accessoires, calibration tools and consumables. Since foundation of S&E in year 1993 there are still increasing requirements for realtime informations on particle characterization of size. shape, morphology within development and formulation from laboratory, pilot plant, research or process. Sequip wants to meet customer requirements with the optimal measuring system for every application. Every user has different condotions, requirements and visions, so we offer different oppurtunities to introduce in our technology. PIA (Particle Image Analysis) video probe Series provides size measuring based on the shape of the measured particles or crystals. 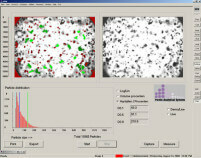 PIA probes work in real time and under insitu conditions and detect size and shape of the particles. Display of crystals and particles with insitu image grabbing in real time.